The purpose of this chapter is to encourage the transition to electric vehicle use and to expedite the establishment of a convenient, cost-effective electric vehicle infrastructure that such a transition necessitates. (Ord. 2553 § 2, 2010). “Accessible electric vehicle charging station” means an electric vehicle charging station where the battery charging station equipment is located within accessible reach of a barrier-free access aisle (minimum 44-inch width) and the electric vehicle. “Battery charging station” means an electrical component assembly or cluster of component assemblies designed specifically to charge batteries within electric vehicles, which meet or exceed any standards, codes, and regulations set forth by Chapter 19.28 RCW and consistent with rules adopted under RCW 19.27.540. “Battery electric vehicle (BEV)” means any vehicle that operates exclusively on electrical energy from an off-board source that is stored in the vehicle’s batteries, and produces zero tailpipe emissions or pollution when stationary or operating. “Battery exchange station” means a fully automated facility that will enable an electric vehicle with a swappable battery to enter a drive lane and exchange the depleted battery with a fully charged battery through a fully automated process, which meets or exceeds any standards, codes, and regulations set forth by Chapter 19.27 RCW and consistent with rules adopted under RCW 19.27.540. 1. Level 1. Voltage including the range from zero through 120. 2. Level 2. Voltage is greater than 120 and includes 240. 3. Level 3 is considered fast or rapid charging. Voltage is greater than 240. “Designated accessible space” means an accessible parking space required by WAC 51-50-005 and designated for the exclusive use of parking vehicles with a State Disabled Parking Permit. “Electric scooters and motorcycles” means any two-wheel vehicle that operates exclusively on electrical energy from an off-board source that is stored in the vehicle’s batteries and produces zero emissions or pollution when stationary or operating. “Electric vehicle” means any vehicle that operates, either partially or exclusively, on electrical energy from the grid, or an off-board source, that is stored on board for motive purpose. “Electric vehicle” includes: (1) a battery electric vehicle; (2) a plug-in hybrid electric vehicle; (3) a neighborhood electric vehicle; and (4) a medium-speed electric vehicle. “Electric vehicle charging station” means a public or private parking space that is served by battery charging station equipment that has as its primary purpose the transfer of electric energy (by conductive or inductive means) to a battery or other energy storage device in an electric vehicle. An electric vehicle charging station equipped with Level 1 or Level 2 charging equipment is permitted outright as an accessory use to any principal use. “Electric vehicle charging station – public” means an electric vehicle charging station that is (1) publicly owned and publicly available (e.g., park and ride parking, public library parking lot, on-street parking) or (2) privately owned and publicly available (e.g., shopping center parking, nonreserved parking in multifamily parking lots). “Electric vehicle charging station – restricted” means an electric vehicle charging station that is (1) privately owned and restricted access (e.g., single-family home, executive parking, designated employee parking) or (2) publicly owned and restricted (e.g., fleet parking with no access to the general public). “Electric vehicle infrastructure” means structures, machinery, and equipment necessary and integral to support an electric vehicle, including battery charging stations, rapid charging stations, and battery exchange stations. “Electric vehicle parking space” means any marked parking space that identifies the use to be exclusively for the parking of an electric vehicle. “Medium-speed electric vehicle” means a self-propelled, electrically powered four-wheeled motor vehicle, equipped with a roll cage or crush-proof body design, whose speed attainable in one mile is more than 25 miles per hour but not more than 35 miles per hour and otherwise meets or exceeds the federal regulations set forth in 49 CFR 571.500. “Neighborhood electric vehicle” means a self-propelled, electrically powered four-wheeled motor vehicle whose speed attainable in one mile is more than 20 miles per hour and not more than 25 miles per hour and conforms to federal regulations under 49 CFR Part 571.500. “Plug-in hybrid electric vehicle (PHEV)” means an electric vehicle that (1) contains an internal combustion engine and also allows power to be delivered to drive wheels by an electric motor; (2) charges its battery primarily by connecting to the grid or other off-board electrical source; (3) may additionally be able to sustain battery charge using an on-board internal-combustion-driven generator; and (4) has the ability to travel powered by electricity. “Rapid charging station” means an industrial grade electrical outlet that allows for faster recharging of electric vehicle batteries through higher power levels and that meets or exceeds any standards, codes, and regulations set forth by Chapter 19.28 RCW and consistent with rules adopted under RCW 19.27.540. (Ord. 2553 § 2, 2010). Electric vehicle infrastructure shall be permitted in zoning districts of the city as identified in MTMC 19.23.100. (Ord. 2553 § 2, 2010). 3. The parking capacity of an existing building, site, or parking facility is increased by more than 50 percent. B. The first column in Table 19.126.040 shows the type of land use for which electric vehicle charging stations shall be provided, pursuant to this section. The second column shows the minimum percentage of the facility’s parking spaces that shall provide a connection to electric vehicle charging stations. C. Design for Expansion. In order to allow for additional electric vehicle parking in the future as the market for such vehicles grows, beginning January 1, 2011, all development that meets the criteria of subsection A of this section shall be designed to allow for double the amount of electric vehicle parking shown in Table 19.126.040. Site design must provide electrical, associated ventilation, accessible parking, and wiring connection to transformer to support the additional potential future electric vehicle charging stations. (Ord. 2553 § 2, 2010). A. Size. A standard size parking space shall be used for an electric vehicle charging station where such a station is required or planned. B. Installation and Equipment. The station installation and equipment shall be consistent with the rules and regulations adopted pursuant to RCW 19.27.540, Electric vehicle infrastructure requirements, and with applicable regulations under the City’s building code, Chapter 15.05 MTMC, and fire code, Chapter 15.10 MTMC. C. Location, Design, and Maintenance. Where provided, parking for electric vehicle charging purposes shall meet the standards of subsections (C)(1) through (5) of this section. 1. Signage. 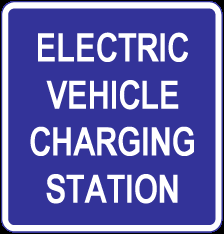 Each charging station space shall be posted with signage indicating the space is only for electric vehicle charging purposes. Days and hours of operation shall be included if time limits or tow-away provisions are to be enforced. 2. Clearance. Charging station equipment mounted on pedestals, light posts, bollards or other devices shall be a minimum of 24 inches clear from the face of curb. 3. Charging Station Equipment. Charging station outlets and connector devices shall be no less than 36 inches or no higher than 48 inches from the top of surface where mounted, and shall contain a retraction device and/or a place to hang permanent cords and connectors sufficiently above the ground or paved surface. 4. Charging Station Equipment Protection. When the electric vehicle charging station space is perpendicular or at an angle to curb face and charging equipment, adequate equipment protection, such as wheel stops or concrete-filled steel bollards shall be used. 5. Maintenance. Charging station equipment shall be maintained in all respects, including the functioning of the charging equipment. A phone number or other contact information shall be provided on the charging station equipment for reporting when the equipment is not functioning or other problems are encountered. D. Data to Be Available. To allow for maintenance and notification, the owners of any private new electric vehicle infrastructure station that will be publicly available (see definition of “electric vehicle charging station – public”) shall provide information on the station’s geographic location, date of installation, equipment type and model, and owner contact information. E. Time limits may be placed on the number of hours that an electric vehicle is allowed to charge, prohibiting indefinite charging/parking. If applicable, warnings shall be posted to alert charging station users about hours of use and possible actions affecting electric vehicle charging stations that are not being used according to posted rules. F. Electric vehicle signage shall be provided pursuant to MTMC 19.126.090. G. Location. Placement of a single electric vehicle charging station is preferred at the beginning or end stall on a block face. (Ord. 2553 § 2, 2010). A. Where electric vehicle charging stations are provided in parking lots or parking garages, excluding garages in single-household residential units, accessible electric vehicle charging stations shall be provided according to the ratios shown on Table 19.126.060. The first column indicates the number of electric vehicle stations being provided on site and the second column indicates the number of accessible charging stations that are to be provided for the corresponding number(s) of charging stations. B. 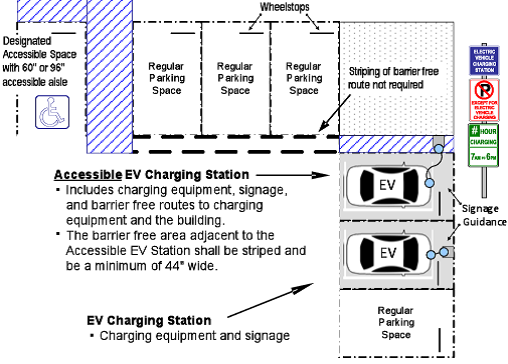 Accessible electric vehicle charging stations should be located in close proximity to the building or facility entrance and shall be connected to a barrier-free accessible route of travel. It is not necessary to designate the accessible electric vehicle charging station exclusively for the use of disabled persons. 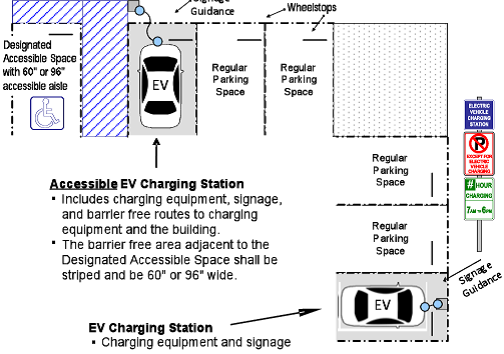 Below are two options for providing for accessible electric vehicle charging stations. (Ord. 2553 § 2, 2010). A. Electric vehicle charging stations, where provided for public use, are reserved for parking and charging electric vehicles only, except as otherwise provided by this chapter. B. Electric vehicles may be parked in any space designated for public parking, subject to the restrictions that would apply to any other vehicle that would park in that space. (Ord. 2564 § 2, 2011; Ord. 2553 § 2, 2010). A. No person shall stop, stand or park any nonelectric vehicle in a space designated through signage as an electric vehicle charging station. Any nonelectric vehicle is subject to removal by the property owner or the property owner’s agent. B. Any electric vehicle in an electric vehicle parking stall that is signed exclusively for electric vehicle charging and that either (1) is not electrically charging or (2) is parked beyond the days and hours designated on regulatory signs posted at or near the space shall be subject to removal as posted by the property owner or the property owner’s agent. For purposes of this subsection, “charging” means an electric vehicle is parked at an electric vehicle charging station and is connected to the charging station equipment. (Ord. 2564 § 3, 2011; Ord. 2553 § 2, 2010). A. Electric vehicle charging stations, other than in residential use, shall have posted signage, as identified in this section, allowing only charging electric vehicles to park in such spaces. 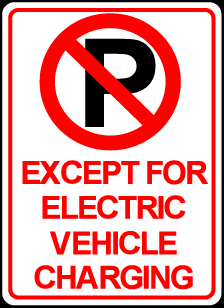 (Exception: the Director may allow an exemption for such signage at a portion of electric vehicle parking stalls within a publicly owned transit center upon the public transit agency demonstrating through a utilization study that not all of the electric vehicle charging stalls are needed for commuters using transit and that the amount of nonelectric vehicle parking is inadequate to meet existing needs; such exemption may be renewed by the Director each year, based on a utilization study completed during the prior year.) For purposes of this subsection, “charging” means that an electric vehicle is parked at an electric vehicle charging station and is connected to the charging station equipment. 1. Information on the charging station to identify voltage and amperage levels and any time of use, fees, or safety information. 2. As appropriate, directional signs to effectively guide motorists to the charging station space(s). C. Optional Signage. Optional information may be posted to alert potential charging station users to other expectations. (Ord. 2564 § 4, 2011; Ord. 2553 § 2, 2010).